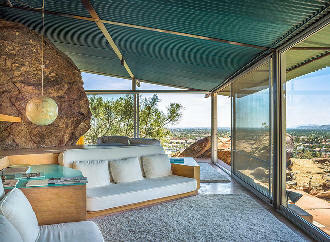 If you're into architecture, you don't want to miss USModernist's wildly popular trip to Palm Springs for Modernism Week; the experience is to mid-century Modernist design what the Super Bowl is to football! There's no other place in America with as many mid-century Modern houses per square mile with thousands of Modernist houses and buildings. Enjoy all-you-can-eat Modernist architecture from art to furnishings to lifestyles to fashion to food! You'll fly direct to LAX via Delta. You'll go back in time as we stay at the swanky and just-renovated mid-century Hotel Skylark. Plus you get event admissions, exclusive private tours, eye-popping Hollywood-style parties, and a walkable location to downtown Palm Springs. There's our own free private open bar, available every afternoon and early evening when we aren't touring. Did we forget to mention free Uber service around town? I think we did. Roundtrip direct flight to LAX on Delta. All airport transfers, plus transport on all USModernist tours. Five nights at the Hotel Skylark, a retro boutique hotel with free internet, a really good breakfast (oh the frittatas), glamorous pool, free wifi, our own private open bar, and a hot tub. 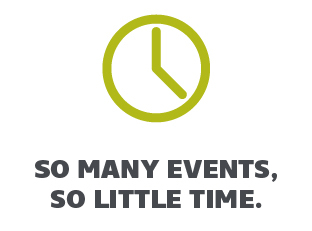 Tours nearly every day and a dinner or evening reception/party nearly every evening. Opportunity to watch poolside tapings of USModernist Radio with George Smart, Tom Guild, and keynote speakers from Modernism Week. An optional lunch at an In-n-Out Burger, California's much-loved joint! 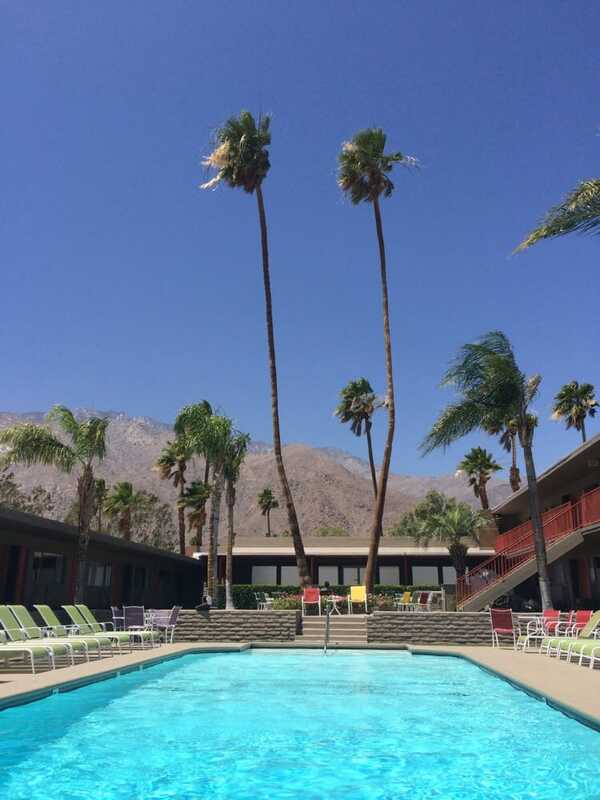 A special Uber account for up to $60/person for within Palm Springs. It's like having your own driver. Actually, it is exactly like having your own driver. Free BUZZ trolley service downtown Thursday through Saturday nights. BUZZ stops right in front of the hotel. 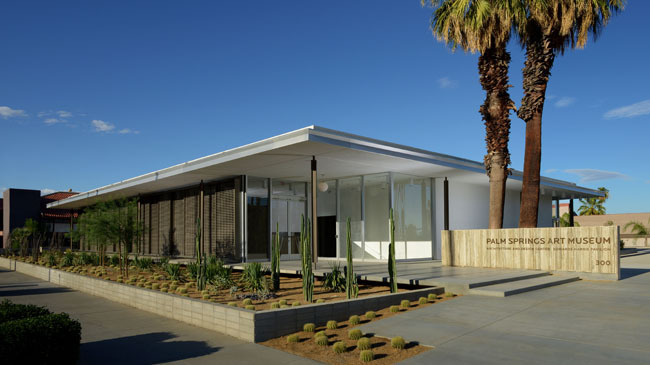 A special private guided Palm Springs Modernist tour with Modernist architecture expert Trevor O'Donnell. 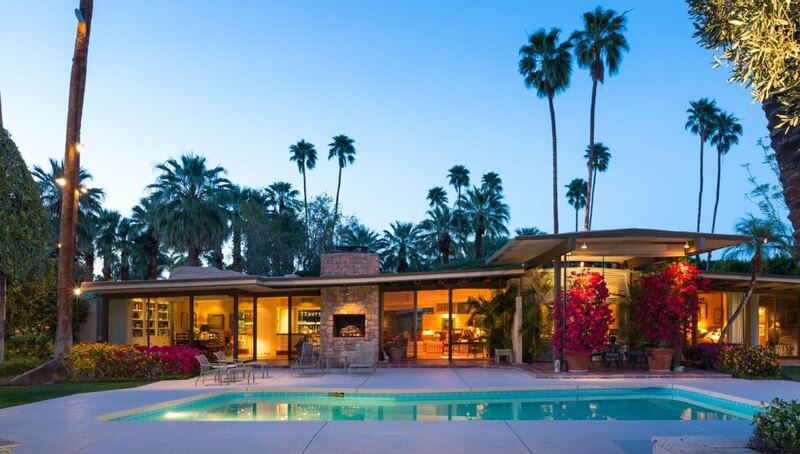 Rare interior tours of Sunnylands Estate, the "Western White House," designed by A. Quincy Jones; plus the Frey House II, designed by Albert Frey. Admission to exclusive parties such as the famous Retro Martini party on Friday night. In the past we were in Leonardo DiCaprio's house and Kirk Douglas' house (Leo and Kirk, sad to say, were not). 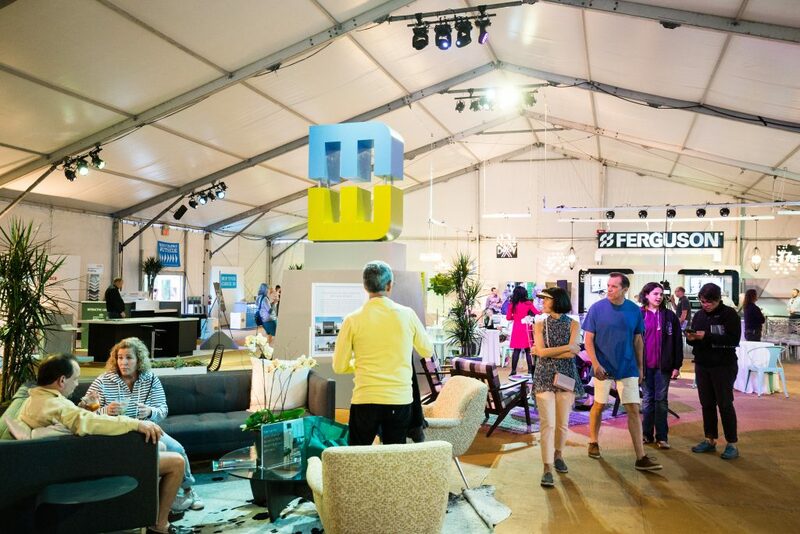 Plus you will access the huge array of movies, lectures, presentations, exhibitions, other tours, and art installations put on by Modernism Week (extra charge for some of these, you'll register directly with Modernism Week). 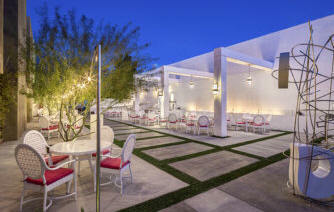 7am - Fly direct to LAX, then transfer via private coach to the swanky Skylark Hotel in Palm Springs. We pretty much take the place over for the week! 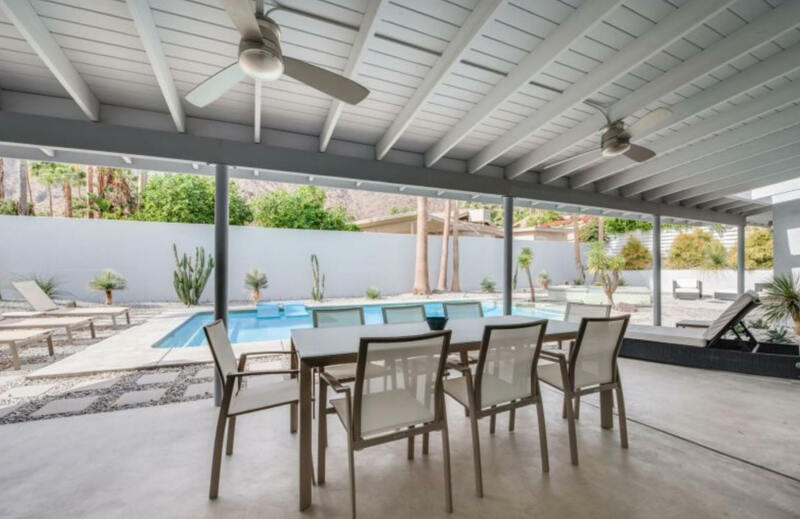 Half the group will tour the Frey House II, one of Palm Springs most famous Modernist houses, and the rest will tour tomorrow. 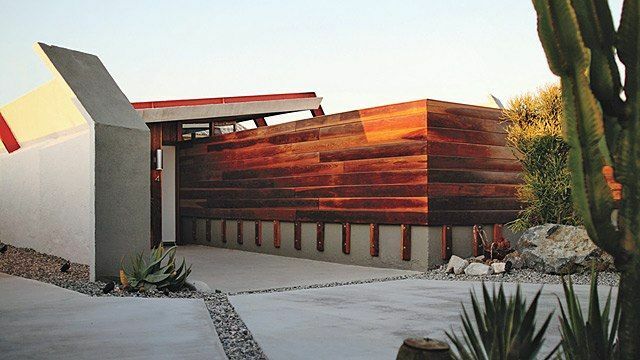 7pm - Welcome Poolside Reception and Dinner at a private Modernist house in Palm Springs, hosted by one of our members! 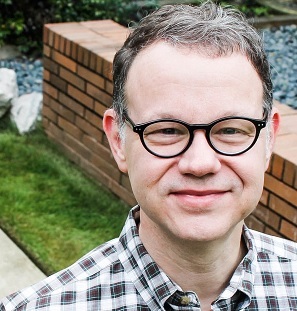 830am - Private House and Town Tour with Trevor O'Donnell, including dozens of buildings and homes with some exclusive interior visits. 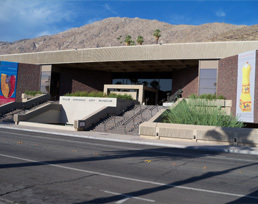 Lunch and afternoon on your own; we recommend visiting the Palm Springs Art Museum, the Palm Springs Architecture and Design Center, and CAMP, the HQ for Modernism Week. 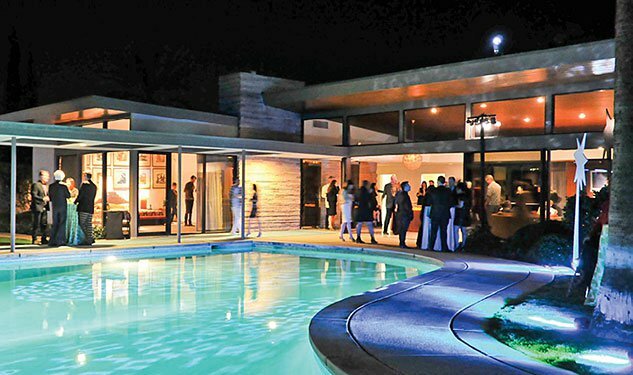 7pm - You get tickets to USModernist's first national benefit at the Kirk Douglas house. 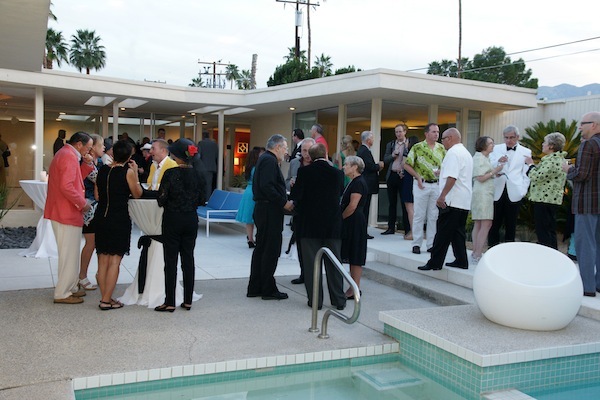 USModernist Benefit Party, featuring 185 guests at the Kirk Douglas House! 430pm - Exclusive tour and sunset reception at the Hotel Lautner, designed by John Lautner. Dinner on your own, if you're still hungry. 5pm - Palm Springs Preservation Foundation's annual Retro Martini Party. For this, you'll want to get dressed up. It's a free day - morning, lunch, and afternoon on your own. 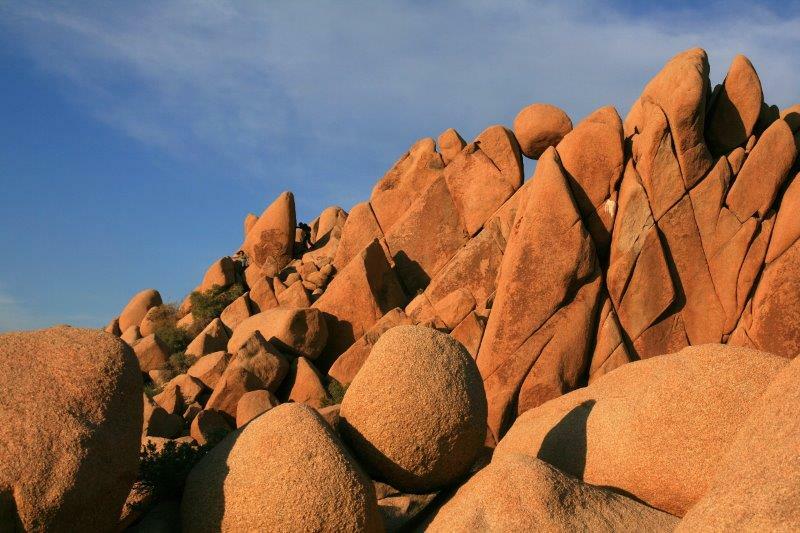 Some people go to Joshua Tree National Park, some stay by the pool, some go to the Palm Springs Tramway, some go shopping! 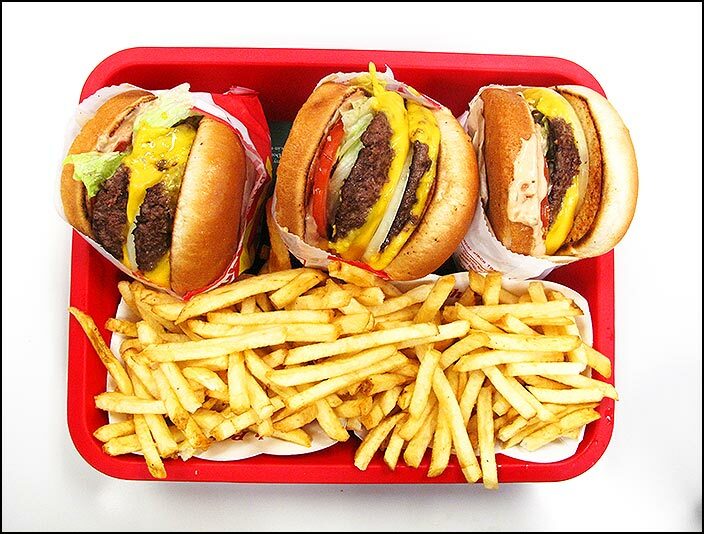 USModernist Radio's George Smart and Tom Guild will head to the famous In-n-Out Burger at 11am. Why so early? You'll find out. George and Tom are buying. 7pm - So sad, sniff sniff. It's our lovely farewell dinner at Eight4Nine, one of the top restaurants in Palm Springs. Amazing. Typically each day there will be breakfast, a tour in the morning, and a great party or reception or dinner in the evening. During the afternoons, you can choose from extra Modernism Week activities available directly from the Modernism Week website. 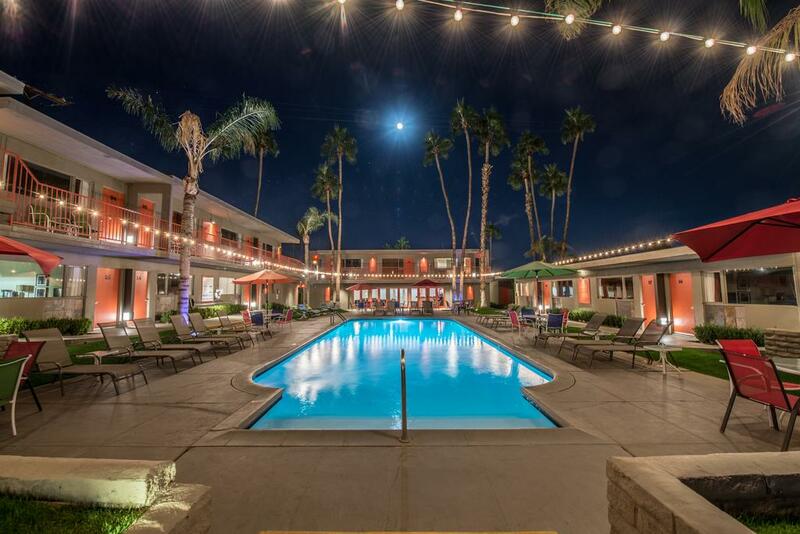 Or walk, shop, drink, sleep, swim, tan, or eat your way through the magic that is Palm Springs during Modernism Week. Or sit by the pool, just a few feet from your door. Weather in Palm Springs is usually cool and sunny. Many tours are on foot, so make sure to bring walking shoes. At least one evening party involves dressing up but everything else is casual. Proceeds benefit USModernist's ongoing documentation, preservation, and promotion projects. We are a North Carolina 501C3 nonprofit. 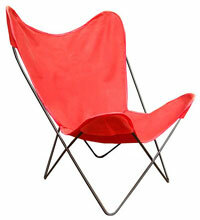 Questions, please contact USModernist Executive Director George Smart at 919.740.8407 or george@usmodernist.org. Once payment is made, there are no refunds for any reason except for trip cancellation. However, you can sell or give your place to another person with at least two weeks written notice to USModernist. You are responsible for any checked bag fees with Delta, both coming and going. If you have free bag status with the airline, you can declare that at check-in. There is NO SMOKING of any kind at the hotel, inside or outside. Parking at RDU airport is not included. You're responsible for incidental charges to your hotel room. There is a small but possible risk of overnight stay if flights are cancelled or delayed, in which case participants are responsible for any additional costs of meals, lodging, transportation, and incidental expenses. With over 80 tours, this has never happened, but it could.